1. Prepare filling: Heat oil in a wok. Add meat and stir-fry briefly (until cooked through, if raw). Add vegetables and stir-fry about 2 minutes. Combine chicken broth, oyster sauce, sugar, and cornstarch. Add to wok and stir-fry until sauce thickens. Let filling cool before filling spring rolls (refrigerate if you're in a hurry). 2. To prepare each spring roll: Position one wrapper like a diamond with one point facing you. Place about 2 tablespoons of filling in a log shape across the bottom about 2" from the lowest corner. Fold the bottom corner up over the filling and tuck it behind the filling. Roll the packet up once to enclose the filling securely. Moisten the three remaining corners of the wrapper with beaten egg. Fold the left and right corners to the center and press down firmly to seal, forming an envelope. Finish rolling up, sealing the top corner. Repeat with remaining packets. 4. In a deep-fryer or wok, heat 4 cups of oil to 360 -375 degrees F. Deep-fry spring rolls a few at a time, until crisp and golden. Drain on paper towels. 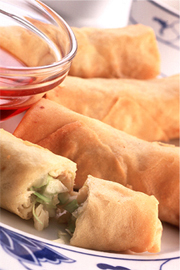 Serve the spring rolls hot, whole or cut in thirds, with plum sauce as a dip.